How do you grill a perfect steak? Well you've come to the right place! 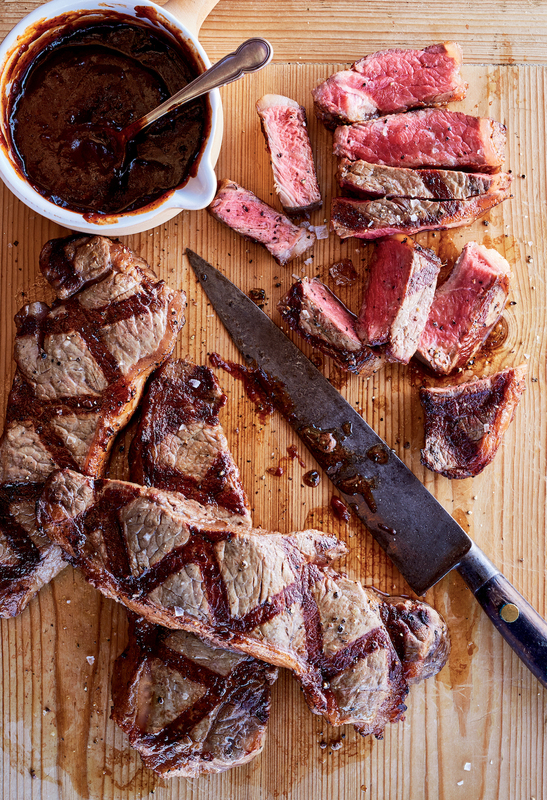 Here are 5 tips to grilling the perfect steak. Scroll to the bottom to get a fan favorite recipe from Weber's Greatest Hits. Preview more recipes from the cookbook here. You might have heard the warning that you shouldn’t salt meat too far in advance of cooking because it can draw out moisture. It’s true that salt draws moisture towards itself, but over the course of 20 to 30 minutes that’s a good thing, because the salt begins to dissolve into that little bit of moisture. When the steak hits the hot cooking grate, the sugars and proteins in the moisture combine with the salt and other seasonings to create a delicious crust. Any moisture you might lose is well worth the flavor of that crust. The goal of grilling a steak is to brown and lightly char the surface while also cooking the interior to a perfectly juicy doneness, right? If the steak is too cold, the interior might require so much cooking time to reach that perfect doneness that the steak overcooks deep below the surface, turning gray and dry. Let your steaks stand at room temperature for 20 to 30 minutes before grilling. They will cook faster all the way to the center and stay juicer. One good habit that separates professional chefs from many home cooks is that chefs spend more time searing their steaks. They understand that searing develops literally hundreds of flavors and aromas on the surface of steak, so they let their steaks sizzle over direct heat until the surfaces are dark, dark brown. Don’t let anyone tell you that searing “locks in the juices.” That’s a myth. But searing sure does make steak tasty. Most steaks grill beautifully over direct high heat alone. The only time you might need to move them is if/when they cause flare-ups. However, some steaks are so thick that if you left them over direct heat alone, they would burn on the outside before they reached the internal doneness you like. If your steaks are much thicker than an inch, consider the sear and slide approach. After you have seared both sides nicely over direct high heat, slide the steaks to a part of the grill that is not so hot, perhaps over indirect heat, and finish cooking them safely there. As steaks grill over high heat, they lose moisture. Fat and juices are literally pushed out of the meat. That’s the price we pay for making the steaks easier to digest. Perhaps the most important part of grilling a steak is taking it off the heat before it has lost too much moisture. There is a short window of time, usually just a minute or two, when steaks go from medium rare to medium, or from medium to medium well. Catching that window requires vigilance. Don’t walk away from a steak on the grill. And remember, it’s always better to take it off when it’s underdone and then return it to the grill than it is to let a steak overcook. Here is a great fan favorite recipe for you to try out! 1. In a saucepan over medium heat, melt the butter. Add the shallot and cook until it begins to brown, about 3 minutes, stirring often. Add the garlic and cook until fragrant, about 1 minute. Stir in the remaining sauce ingredients, bring to a simmer, and reduce the heat to low. Simmer until slightly reduced, about 10 minutes, stirring often. Transfer to a bowl to cool. 2. Brush the steaks on both sides with the oil and then season on both sides with the salt and pepper. Let the steaks stand at room temperature for 15 to 30 minutes before grilling. 3. Prepare the grill for direct cooking over high heat (450° to 550°F). 4. Brush the cooking grates clean. Grill the steaks over direct high heat, with the lid closed, until cooked to your desired doneness, 6 to 8 minutes for medium rare, turning once. Remove the steaks from the grill and let rest for 3 to 5 minutes.